THERE are certain plants that are very much around but their potential for beauty remains untapped. In fact it is the way you select the site, plant or display when grown in pot, that the best of it comes to the fore. 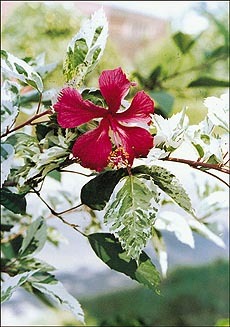 Hibiscus variegated is one such plant. A revered flower used in Durga Puja, Hibiscus, in fact, is one of the most common plants that finds place in every garden. But what we usually see is the one with red flowers, mostly used as hedge. Making a hedge with Hibiscus is not a good choice as it requires repeated cutting to keep the growth disciplined. And if at all you want to do it, plant the clipping in a way that you get blooms too. One of the fast growing plants, Hibiscus is now available in almost all hues  red, orange, yellow, white, pink, crimson and even in blue. The flowers are prominently large and showy. It is not only the beauty of the bloom. The plant has variegated species, too, and a combination of green and white foliage with pinkish flowers makes it a spectacular dual beauty specimen plant. Hibiscus could be grown in pots too provided they receive full sun. Hibiscus must be pruned in winter or early spring to encourage maximum number of branches. The extent of pruning depends upon the size of the plant you want to maintain. The intensity would be from light to severe. Hibiscus is not very demanding for soil selection but it should be well drained as the plant is prone to collar rot wherein the ground-stem-contact portion rots. Slightest excess in moisture in roots could lead to root rot. Do not select the site which is near the tap. The seepage could be fatal for the plant. But that does not mean you should let the soil completely dry, especially when it is time for bloom. Under such conditions, there will be bud drop. Spraying the plant with water once a week will not only give the leaves their shine but also keep the sucking type of insects at bay. Do not feed the plant heavily. You will end up having more of vegetative growth at hand at the cost of blooms. Hibiscus is mostly attacked by flower beetles. Spraying sevin at 2.5 gm to litre of water helps. Hibiscus attracts black ants too. An occasional spray of rogor or malathion will take care of it. When it comes to ornamental foliage shrubs, you cannot miss the mention of duranta. It is mostly used as a hedge. Due to repeated cutting that this plant requires, not many people know that the beauty of this plant lies in the abundant blue and white tiny flowers that go well with the green or foliage. The blooms are succeeded by beautiful beads like berries that appear in clusters. Golden duranta is one which is the latest craze with the gardeners. In a mixed planting in border, it provides a chequered appearance in the garden. The plant is very hardy and stands drought well.